Home | Home: Free Sociology! There’s a talk at UBC Sociology here in Vancouver this week that’s right up my alley! Honorary Research Associate Martin Fuller will be speaking to his research on Baugruppe (see here and here), with a lovely riff on Heidegger for the title of his talk. Come check it out! Abstract: This talk will outline a sociological approach to inhabitation that treats housing as a verb, housing as an activity. It does so through building up some of the lessons learned from an in-depth case study of a new residential building in Berlin. This building is unique for two reasons, firstly it was produced by a so-called ‘Baugruppe’, a group of people who are involved in the participatory planning of the building that holds their future homes, and secondly this group includes both private owners and a co-operative housing association. This talk looks into some of the dynamics of participatory planning, building and dwelling. Martin Fuller is a researcher at the Technische Universität Berlin (Berlin Institute of Technology) in the Department of Sociology. His main research interests are in cultural and urban sociology, often looking at the intersections of the two. His PhD was completed at the University of Cambridge and researched early career visual artists in New York and Berlin. Today’s talk draws upon his recent research on housing, architecture, space and home. The talk will be in ANSO 2107, from 11:00-12:20 on April 25. Lunch will be provided. Squatting is an inherently political act, and here it’s also something of an art form. But this squat is temporary; more like performance art than marble carving. A possession order is scheduled to be heard in court on January 31st to take the mansion back for the oligarch. So what does it take to make a squat last? Turning to more familiar shores, the shacks below were built and inhabited by squatters on Stanley Park in Vancouver in the early decades of the Twentieth Century. For a long time, squatters were a regular and visible feature of Vancouver. They can still be found if you know where to look, but outside of performance art squats, as with the Woodwards Squat, they’re largely forced into maintaining invisibility. Steve Borik’s tidy little tarp-shack set up on an empty lot along the Fraser River is a case in point. He was able to live there for months, nice and quiet, until transit police stumbled over his shack in 2015. As a general rule, squats and squatter communities no longer seem to successfully establish themselves in the UK, the US, Canada, or Australia. There are exceptions (like Dignity Village in Portland, up and running at its present site since 2001). And there have also been attempts to revive squatting as a movement, especially after the wave of foreclosures associated with the Great Recession of 2008. But contrast these experiments with much longer-running squats elsewhere, like Christiania in Copenhagen, Denmark. Or even better, look to informal settlements in Mexico City, Delhi, and a wide variety of other cities. So what determines why squats last as living communities in some places, while appearing more like performance art in others? Is the English colonial and common-law system to blame for developing in such a way to squash squats flat as soon as they spring to life? Is there something about settler societies, founded upon enclosure, dispossession, and active ignorance of competing claims, that leads to especially vigorous state interventions to clarify ownership? Fun ideas for future research, especially in light of the forthcoming workshop on Property Law in the City at UBC’s Allard Law School. *- It’s worth noting that on quick glance, both the numbers of homeless and the numbers of empty buildings in London appear to be low, adjusting for the size of the city, relative to places like Vancouver. Also: London (and England in general) has a lot more social housing! Immigrants are people. They’re a highly selected set of people, but they are fundamentally human. This all too often gets lost in discussions about their impact on local housing. That they’re mostly coming to Vancouver to make a better home for themselves is a fundamentally human thing to do. And Vancouver is a great place to make a home. The selection processes concerning who gets invited to come to Vancouver matter. Many (but not all) of these processes are policy-relevant. Right now Canadian immigration policy selects heavily for “skill” and wealth (it is difficult to fully disconnect the two, though the skilled stream selects more upon our constructions of the former and business/investment streams have selected more for the latter). The assumptions behind this selection are that these immigrants will most contribute to the dynamism of the Canadian economy. As such, the policy is very much market-focused and oriented toward the business world rather than considering other motivations for immigration or broader questions about social justice. The selection processes concerning who makes a decision to come (or try to come) to Vancouver also matter. Mostly those who make this decision already know (thanks to things like internet chat forums) that they will not have nearly as many economic opportunities in Canada as they already do in China. If you’re really into economic dynamism and a high status career, you stay in China! So most immigrants who come to Vancouver from China select themselves for being more interested in the quality of life in Canada. They want cleaner air, safer food, better and more sensitive education for their children. They want a home life, where they can spend time with their children. They also want a responsible and navigable bureaucracy, where they don’t need to know the right people or bribe their way to get what they feel they need. These are all very human things to want, and they all involve appreciating what Canada has to offer – not free market dynamism, but rather careful restrictions and regulations placed around markets by a largely responsive government to make them work better for people. [Yes, yes, Canada doesn’t always do this to my satisfaction, but compared to China we do it pretty well]. So mostly the people who select themselves to come to Canada are nice, home-loving sorts who really appreciate what Canada has to offer them. But because of Canadian immigration policies (as well as the difficulties in navigating bureaucratic systems in China), they also tend to be quite privileged and well-off. This is the world which my comment to Frances that, “Canada could look at letting in fewer millionaires and more refugees” was meant to reflect. There are plenty of nice, home-loving sorts of people who would really appreciate what Canada has to offer them currently being excluded by Canadian immigration policies. And many of them need better homes far more than the wealthy privileged folks we’re currently inviting to the country. That said, I’m also quite sympathetic to letting in more immigrants period, and I don’t mean to suggest those who have already arrived are in any way undeserving. So I’m not seeing villains, but are they out there? Are corrupt officials, ruthless capitalists, and their extended family members also getting into Canada, and using immigration to hide their wealth? This seems very likely. There are corrupt officials, ruthless capitalists, and their extended family members from countries all over the world doing terrible things (I believe there might be one running for president of the United States at the moment). And they often get away with it. We should try and stop that from happening. But I’d suggest these people are relatively rare, and they’re certainly a minority among immigrants to Vancouver. Indeed, the folks we talked to were selected for rejecting that aspect of life in China. They came to Canada to get away from cronyism and corruption. So I think villains are quite rare, but it’s worth noting that the wealth flowing into places like Vancouver has had an enormous impact on local life. Housing prices, in particular, have risen astronomically, motivating much of the ire at new immigrants, especially those coming from China. We should acknowledge that regardless of the intentions of wealthy immigrants, they’re contributing to processes of gentrification on a global scale. It’s important that we work to figure out equitable ways of dealing with this from a policy standpoint (I’m not sure the foreign-buyer tax qualifies, but I’ll admit it represents at least an effort). But it’s also important that we work on this without demonizing immigrants. A few years ago I received a grant (with co-I Frank Tester) to explore more closely the connections between housing and home in two locations with marked housing crises: Vancouver, BC and Arviat in Nunavut. And so the Making Housing Home project was born. The basic starting point for the work was that housing was an important component of home, but did not, in and of itself, constitute home. Instead home could be found in our routines and connections to a wide variety of people, places, and things. So we set out to document everyday routines and their relationship to housing. Mostly we worked through in-depth interviews and collaborative calendar and map construction projects. But we tried as many different ways to get at home as we could think of. One sub-project involved working intensively with youth in both Arviat and Vancouver to get cameras and some basic photography training into their hands and let them document what “at home” looked like for them. One member of my research team, Karina Czyzewski, took an especially critical lead role in this sub-project. Working with the youth in Vancouver, and with other team members, she put together an exhibit at the Roundhouse Community Centre. Then she brought photos and descriptions of home together into this wonderful booklet, which we printed off and gave to all youth participants and several other community partners in both Arviat and Vancouver. I’m now providing an electronic copy of the booklet here to get as wide exposure for it as possible. While our research is still on-going, and I’ve got a whole lot of data analysis ahead of me, I think this is a good time to get some of the voices of our participants out there, speaking in their own words about their experiences of home. I think the results speak for themselves. So… at least for the moment… I’ll stop talking about them. Enjoy, and feel free to share widely! A few local media outlets have picked up interest in my book since I announced it was available for pre-sale on twitter and this blog. On the one hand, this is great! I really welcome the exposure for both the book and the ideas it contains. On the other hand, I worry (together with my publisher’s media rep) about too much early exposure before the book is actually available (October!). I don’t really know what the right balance is – we don’t get a lot of media training in academia – but I’ll keep working on figuring it out. In the meantime, I ask for patience from interested reporters with my ham-fisted efforts to manage the roll out of the book and its ideas, and I’m hopeful interest continues into when the book is actually ready to fall into readers’ hands. For now here’s the audio clip from a recent interview talking about my forthcoming book with Stephen Quinn on CBC’s On The Coast. (Or you can just listen to the whole August 11th, 2016 show). I’m a regular listener, so it was really fun to meet Stephen Quinn and Amy Bell and see the inside of the CBC studio. [Update: and here’s the CBC write-up]. 1) The 80% of land base figure speaks to 80% of land set aside to support residential uses (rather than 80% of all land as a whole), and covers the municipality of Vancouver. Metro Vancouver has data on land use broken down by municipality (and a lot of other data besides!) Also Jens von Bergmann over at MountainMath (mentioned in the piece) has a beautiful map breaking down land use by lot within the City of Vancouver, which everyone should check out. It really demonstrates just how much land has been set aside for single-family detached houses (almost entirely in protected RS zones, though there are also duplexes in RT zones and houses in Shaughnessy included, along with a scattering of old houses remaining in places unprotected by zoning). 2) The accompanying photo for the piece, as multiple people have pointed out, looks like it was taken at Mole Hill, which is a lovely little development preserving and rehabilitating old houses downtown by subdividing them up into apartments. To be clear, the census would not consider these to be single-family detached houses, nor would the city. But the ambiguity of how they LOOK like houses (and very photogenic ones at that) is really interesting. 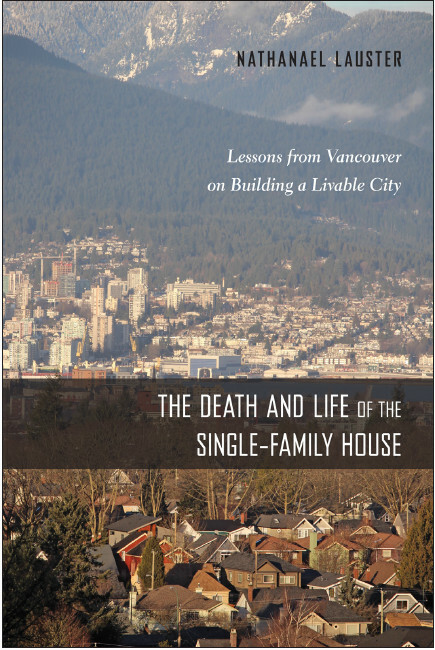 This speaks to the focus of my first chapter in the book, laying out just what we talk about when we talk about single-family detached houses, and how the legal categories don’t always match people’s lay understandings of what counts as a house. It also speaks to the many possibilities for subdividing existing houses to support more households – if zoning laws were modified to allow such a thing (it’s already the case, of course, that most RS zoned lots in Vancouver can now already support up to three households through secondary suite and laneway housing provisions).